0 Cold cathode (e.g. voltage regulator tube). One or two letters to indicate the sequence code. When the single character codes were used up, double character codes were introduced. The number of elements in the tube, the filament counting as 1. For example, the 6SN7 has two cathodes, two grids, two plates, and a filament. A Controlled heater warmup time, although can also be used to denote increased ratings or performance over and above the non-A model. 6SN7GT: Filament rating is between 6.0 - 6.9V, SN=sequence code, 7 elements, glass tubular envelope. 6V6GTY: Filament rating is between 6.0 - 6.9V, V=sequence code, 6 elements, glass tubular envelope, low loss phenolic base. 12AY7: Filament rating is between 12.0 - 12.9V, AY=sequence code, 7 elements. What does J.H.S. and J.A.N. mean? Sylvania was a major manufacturer of Military tubes and selected a 3 digit lettering system to designate Sylvania products. One system prefixes a three-digit number with the letters "VT", presumably meaning "Vacuum Tube". Other systems prefix the number with the letters JHS or JAN. J.A.N. is believed to stand for Joint Army Navy, where as, J.H.S. sometimes remains a mystery, and is commonly thought to just signify Sylvania product. The numbers following these prefixes can be special four-digit numbers, or domestic two- or three- digit numbers or simply the domestic North American RETMA numbering system. Like the British military system, these have many direct equivalents in the civilian types. Confusingly, the British also had two entirely different VT nomenclatures, one used by the Royal Air Force and the other used by the General Post Office, responsible for post and telecommunications at the time, where it may have stood for Valve, Telephone; none of these schemes corresponded in any way with each other. It was introduced during the Second World War to rationalise the previous nomenclatures maintained separately by the War Office/Ministry of Supply, Admiralty and Air Ministry/Ministry of Aircraft Production on behalf of the three armed services for CRTs, receiving and transmitting valves used in army equipments. I personally have researched this in the past, and have come up with the theory that JHS was chosen by Sylvania meaning Joint Havells Sylvania or J.H.S. Havells Sylvania is an international designer and manufacturer of lighting products. It has plants throughout Europe, Asia, North Africa and Central and South America, and is one of the few lighting companies that produces both lamps and lighting fixtures. It is owned by Havells.Founded in the early 1900s as a business that renewed burned-out light bulbs, Sylvania and its predecessor companies ultimately began producing new lamps and then vacuum tubes for the radio industry. Both Tung-Sol and RCA utilized the "Stop-Sign" logo  in brackets. The "hole" in the top mica identifies these USA made tubes from the TUNG-SOL factory in Newark, New Jersey, USA in the 1950's. THE UNITED-ELECTRIC RELABEL CODE 88-37 IS MEANINGLESS AS THEY SIMPLY RELABELED NEW OLD STOCK TUBES FROM TUNG-SOL. RCA, SYLVANIA, AND OTHERS. NO ONE MADE D-GETTER OR SQUARE-GETTER TUBES IN 1988! AND UNITED-ELECTRONICS WAS OUT OF BUSINESS IN 1988! SO 88-37 WAS UNITED-ELECTRONICS INTERNAL NUMBERING SYSTEM AND DID NOT SIGNIFY ANY MANUFACTURING DATE. Especially, during the 1950's war effort, it was a common practice for USA factories to source tubes from each other and re-label them. When a government requirement for CV4017 tube specification came in a Request For Proposal (RFP) to the 4 major USA tube factories they all worked together to source from one another to fill the orders. 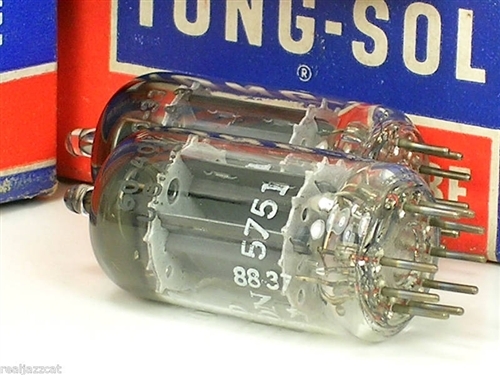 This is why we see so many tubes made by Tung-Sol labeled as RCA, RCA made tubes labeled Sylvania, Sylvania made tubes labeled GE ... and so on, Sylvania, RCA, Tung-Sol and everyone else at some time relabeled tubes! This is why we have to LOOK AT THE ORIGINAL FACTORY CODES IF PRESENT (NOT THE UNITED ELECTRONICS RELABEL CODE),, and identify the real tube manufacturer by codes, inner construction, shape of the tip, and shape of the getter ring to determine the real origin of the tubes. UNITED (United Electrics Company, Newark, N.J., USA) was a company that simply re-labeled Tung-Sol, RCA, Sylvania, and GE USA made tubes for resale.